On paper, the Canon EF-S 17-85mm promises to be the perfect general-purpose lens for owners of Canon DSLRs with compatible mounts. The longer 5x optical range is far more useful than the 3x range of the popularly bundled EF-S 18-55mm kit lens, especially at the telephoto end, and the Image Stabilisation features are genuinely useful. As such the 17-85mm seems ideal for anyone who wants to upgrade from a bundled 18-55mm, or who needs a versatile option for a new EF-S body alone. 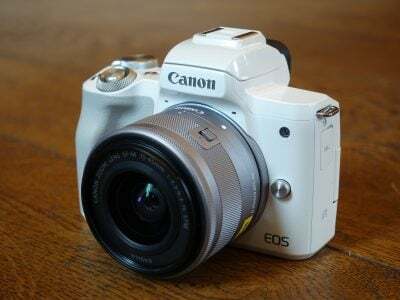 The Canon EF-S 17-85mm f4~5.6 IS USM was announced in August 2004 as general purpose zoom for Canon digital SLRs with EF-S lens mounts; compatible bodies include the EOS 300D / Rebel, EOS 350D / Rebel XT, EOS 400D / Rebel XTi, EOS 20D and EOS 30D. EF-S lenses are not compatible with the EOS 10D, nor any Canon bodies with larger sensors including the EOS 5D, 1D Mark III or 1Ds Mark II. The Canon EF-S 17-85mm delivers a 5x optical zoom ratio with an equivalent focal range of 27-136mm on a 35mm or full-frame body. This offers both wide angle and reasonable telephoto coverage, and a more useful overall range than the budget EF-S 18-55mm kit lens commonly bundled with compatible bodies. The optical construction consists of 17 elements in 12 groups. The EF-S 17-85mm also features Image Stabilisation facilities which claim up to three stops of compensation against camera-shake. In this review we’ll take an in-depth look at the EF-S 17-85mm lens. 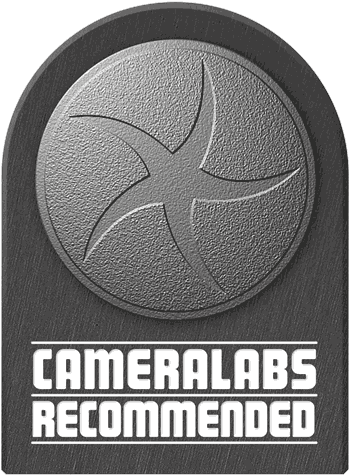 We tested it with the EOS-350D / Rebel XT body and compared its performance against the budget EF-S 18-55mm and higher-end 17-40mm f4L lenses. 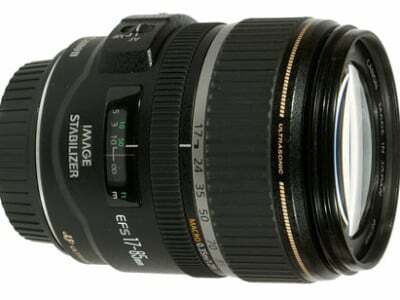 The EF-S 17-85mm lens tested had a serial number of 92001769. UPDATE: We have now tested the Canon EF-S 17-55mm f/2.8 IS USM lens and compared it against the three lenses here using our latest charts. Visit our Canon EF-S 17-55mm review for the latest results. To see how these lenses also compare on an EOS 400D / XTi, see our latest Canon lens group test. NEW: For an overview of the headline features of the EF-S 17-85mm lens, check out our Canon EF-S 17-85mm video tour. The Canon EF-S 17-85mm is pictured below along-side the Canon 17-40mm L and the Canon EF-S 18-55mm lenses in their shortest positions. Here the three lenses from left to right measure 78x92mm, 83.5×96.8mm and 68.5x66mm (diameter x length) respectively. Clearly while the 17-40mm is the biggest of the three, the 17-85mm is not far behind it and both lenses dwarf the budget 18-55mm. When zoomed-in to their longest focal lengths, the 17-85mm and 18-55mm lenses extend by 26 and 9mm respectively, while the 17-40mm adjusts its optics internally and doesn’t extend at all. The difference between the three lenses when zoomed-in can be seen below. The two larger lenses are considerably heavier than the budget model. They both weigh-in at 475g (1lb), compared to the almost imperceptible weight of the 18-55mm at just 190g (6.7oz). The filter threads from left to right measure 67, 77 and 58mm respectively. In terms of build quality the 17-85mm is definitely superior to the 18-55mm, although not quite up to the standard of the 17-40mm L; the latter is also the only one of the three to boast dust and drip-proof construction, although this level of environmental sealing was not offered by any EF-S compatible body at the time of writing. Both the 17-85mm and 17-40mm feature USM motors for fast and quiet focusing. The 18-55mm is louder and slower in comparison. 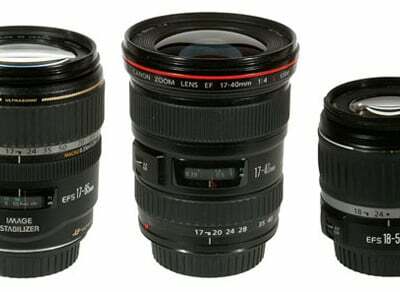 The 17-85mm and 17-40mm also employ internal focusing, making both lenses polariser-friendly. The 18-55mm lens employs a rotating front element, which makes the use of polarisers frustrating. A lens hood is optionally available for the EF-S 17-85mm lens. Canon only supplies lens hoods as standard with its L-series lenses. To see how the EF-S 17-85mm measures-up alongside the EF-S 17-55mm, see our Canon EOS 400D / Rebel XTi lens group test. To compare actual coverage we shot the same scene with each lens within a few moments of each other; the lenses were set to their widest then longest focal lengths and the camera mounted on a tripod to ensure a consistent position. At first glance the three lenses on test appear to deliver roughly identical wide-angle coverage, but look a little closer and there are differences. The EF-S 18-55mm unsurprisingly delivers a slightly reduced field of view, but interestingly the EF-S 17-85mm captures a slightly wider field than the 17-40mm despite having the same quoted wide focal length. The 17-40mm is the only one of the three which can also work on a full-frame body though, delivering considerably wider views and supporting possible future body upgrades. With each lens zoomed into their longest focal lengths, the differences are unsurprisingly much greater. The budget 18-55mm enjoys a noticeably longer reach than the 17-40mm, but neither come close to the 17-85mm when it’s fully zoomed-in. While the other two lenses are still essentially capturing wide shots of the scene in question, the 17-85mm is able to fill the frame with much closer views. It may not make a great difference to distant wildlife or sports photography, but is useful for general travel and portrait compositions. See our Canon EF-S 17-55mm review for more coverage comparisons. The Canon EF-S 17-85mm features Image Stabilisation (IS) facilities which claim up to three stops of compensation – this allows you to handhold much longer exposures than normal and is a boon whether you’re shooting under dim conditions or want to close the aperture right down for very large depths-of-fields. For example, if the slowest exposure you could safely handhold at a certain focal length was, say, 1/60, three stops of compensation should allow you to enjoy the same result at 1/8. This would allow you to get the shot you wanted without having to resort to higher sensitivities and increased noise as a result. 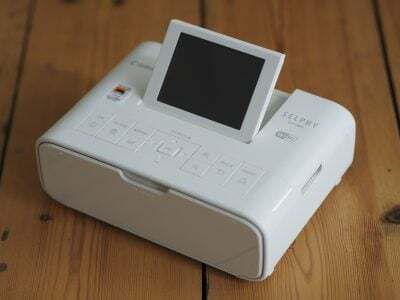 With IS switched on from the side of the lens, the system activates as you half-press the shutter release. As with other IS lenses, there’s a faint click after which the composition through the viewfinder appears to float gently. The system deactivates with another faint click around two seconds after removing your finger from the shutter release. In practice the IS system proved very effective. Below are two examples taken moments apart with the lens fully zoomed-in to 85mm, and therefore operating at an effective focal length of 136mm. With the aperture closed to f32 at 100 ISO, the shutter speed was 1/4 of a second. We cropped an area from each image measuring 564×272 pixels, then reduced it to 282×136 pixels for reproduction here; you’re therefore viewing the images here at 50%. The image without stabilisation, above left, is unsurprisingly shaky. With stabilisation enabled though, it was possible to handhold the same composition and deliver a sharp result. To achieve the same result without stabilisation under the same conditions required a shutter speed of 1/30, confirming three stops of compensation. For more examples of IS in action, check out our Samples, where you’ll see it allowed us to shot under very low light without incurring camera-shake. It’s an extremely valuable feature, although be warned, IS will drain your batteries faster than a lens without. To compare real-life performance we shot the same scene with each lens within a few moments of each other using a Canon EOS-350D / Rebel XT set to its best quality JPEG settings. All lenses here were set to f8 using Aperture Priority mode. The crops are taken from the originals and presented here at 100%.The image left was taken with the Canon EOS-350D using the 17-85mm EF-S at 33mm f8; the original JPEG measured 2.82MB. In terms of actual resolution, there’s little difference between the crops, although the 17-40L has recorded a wider range of tonal detail than the EF-S lenses.